My baby left me stranded. I use my DB9 as my daily driver, and I was out on an errand run – ATM then Dry Cleaning then Lunch – all close together. After the dry cleaning stop I went to start her, and rather than the glorious roar to life, all I got was “Ruh – ruh – click”. Crap – stranded in the local strip mall parking lot amongst all the Fords and Toyotas – all that start. My pride was suffering. Dead Battery. Fortunately my neighbor Rob and his Subaru came to the rescue and gave me a boost. Of course, there are a myriad of reasons for a dead battery – leaving the lights on, failing alternator, etc. Mine was simpler. Batteries don’t last forever. A typical lead acid battery (like those originally fitted to a DB9) have a life span of about 5 years under normal regular use. I had no idea if the battery fitted to my car was the original (since I am not the first owner and have little service history), but as I discovered it was the original, and that meant it was 11 years old! Wow! California living. The snappy and instant start went from “Ruh-Ruh-Vroom” had been slowly changing into “Ruuuhh – Ruuuhh – Vroom”. The starter was turning over slower, a sign of a weak battery with a lower voltage. When I had completed my Coil Pack change out a few months prior the battery had gone mostly flat after three days of being mostly disconnected. Another sign of a weak battery, it wasn’t holding a charge for long. Since I was using the car daily, it got recharged some each day keeping it alive. You can read about how whacky my restart was after changing the Coil Packs by checking out this article. I think this errand run was the final straw since I was driving just a few blocks and then restarting the car each time, with no real time for the alternator to recharge the weak battery between starts. It couldn’t manage the third restart. This set me on a course to learn about what would be a good replacement battery, and how to replace it myself. Certainly, the dealer could do it, but my dealer is 90 miles away and surely, this was something most anyone can handle themselves. I placed a call to my dealer out of interest sake, and they quoted me $560 to supply and replace the battery. We can do it ourselves for about 1/3rd of the cost. Just one. A new battery. But which one? I had no idea if the battery was bespoke to the DB9, or something more common to various cars. I tossed an inquiry into the AMOC forums asking for advice from other DB9 owners (read it here), and got several suggestions. I’ve done some research and here are some of the spec’s for the battery I’ve gathered. Finally, the battery is rated for 830 Cold Cranking Amps (CCA). This was not shown on the label. CCA is a measure of the ‘Umph’ the battery can deliver, how many Amps of power is can push out when cold – tested at 0°F (-18°C). The bigger the CCA, the more starting power you’ll have. You don’t want to choose a battery with a lower CCA rating, but higher is fine (and desirable). Often a lesser capable battery will list their Cranking Amps (CA) or Peak Cranking Amps (PCA) – all will be higher than the CCA. When you compare batteries, compare with the CCA. It is important to note the battery is special that it is designed for INSIDE the passenger compartment, and has a vent tube connection that must be vented outside the cabin. When a battery is charging, it gives off vapors that are not healthy for you to breath. Our DB9’s actually have a small little rubber vent tube that connects to the battery and exits beneath the car. 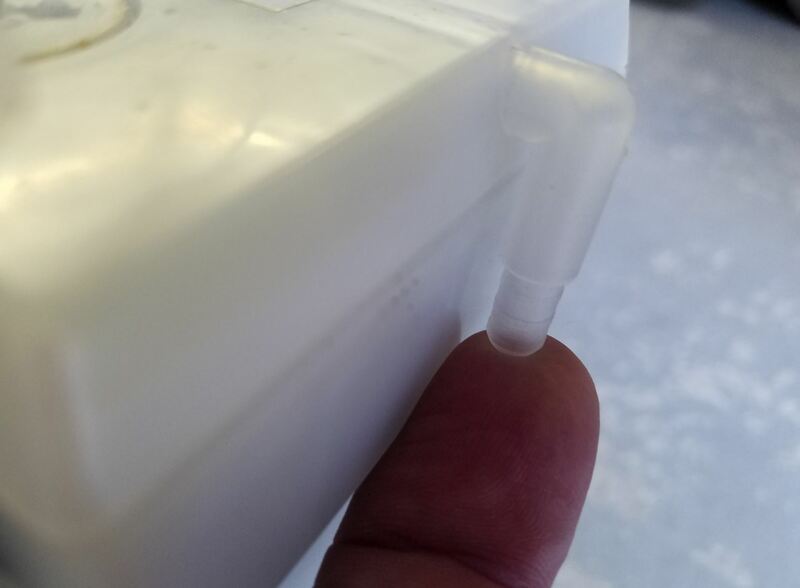 Be sure to fit a battery with the breather tube, and connect it properly! So, basically we are looking for a Group 49/L5/H8 battery with 830 or more CCAs. I am a big fan of Jay Leno’s Garage (the made for car nerd online YouTube pieces, not the watered down made for the masses entertainment TV show). Jay has about 200+ cars in his ‘Big Dawg Garage’ and drives his cars regularly, but can really only drive a car once or twice per year with so many. He recently posted a great video about what type of batteries he uses in all his cars (check it out here). He uses Absorbed Glass Matt (AGM) batteries in all his cars (also knows as Dry Cell Batteries), and he gets his from a company called Odyssey Battery. 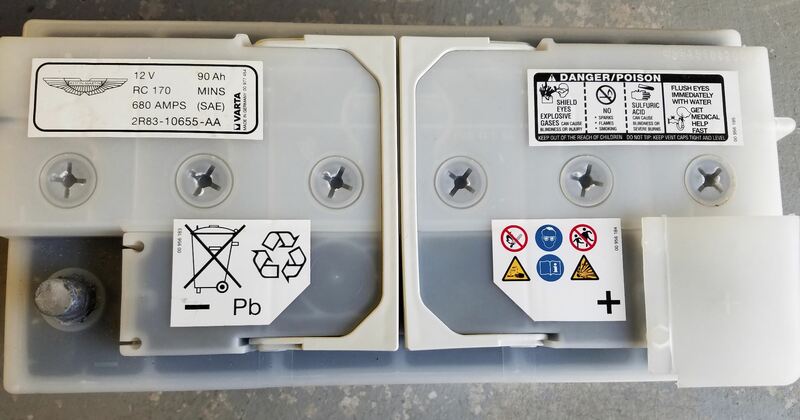 A typical lead acid battery is a series of lead alloy plates (lead combined with a stiffener of calcium) separated and suspended in a bath of liquid acid. Over the course of a batteries life deep discharging and/or poor recharging can result in chemical reactions creating a sulfate build up inside the battery, and reduce the performance of the battery. There are also the physical problems of the liquid, and it can spill or even leak, and the hazardous off gassing that occurs during charging. AGM works similarly, but the lead plates are separated by specially designed glass mats soaked to ~92% capacity with acid (absorbed). There is no liquid slopping around (hence the name Dry Cell), and everything is sandwiched together in direct contact. The plates can be made from pure lead since they will be sandwiched in tight and don’t need to be as rigid. This makes a better battery overall with more CCA for the same size, and they last 10+ years. A win all around. AGM isn’t a unique technology to Odyssey (although I am sure there batteries are probably among the best of the bunch), and many battery makers use AGM technology (Bosch, AC Delco, etc). AGM batteries need a special charger to keep them in top condition if you plan to store you car for long periods of time. Jay’s YouTube video discusses this in detail, and the Odyssey website also covers it. They have intelligent battery chargers for AGM that cycle the battery for best health, vs. a continuous trickle charger that actually lead to shorter battery life. As you’d expect, AGM batteries come at a premium price over standard lead acid batteries. I checked out Odyssey website and they list a battery for the DB9 (model PC1350). It is rated at 770 CCA with a RC of 195 minutes. This battery is 13.90” Wide x 6.88” Deep x 7.48” High (353 x 175 x 190 mm) and weighs 60.4 lbs (27.4 kgs). Note that this is heavier than the OEM battery by 10%. The battery costs $372 USD and has free shipping (to the Continental USA). You can buy the battery online direct from Odyssey, but I couldn’t find a cheaper online source. Ouch. $372 is a lot for a battery. 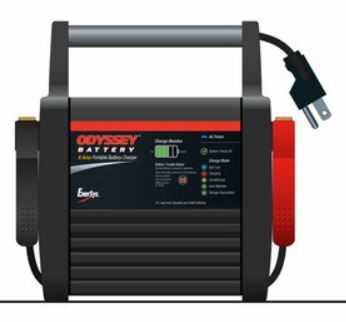 An interesting note about Odyssey Battery, they are made in either the USA or the UK – Buy Local! I could not find an exact replacement Varta battery here in the USA (other than perhaps the dealership) and shipping one from Europe would be ridiculously expensive since it’s so heavy, and there is no need since we have other options. Eventually it donned on me to just try my local auto parts store website and see if they actually carried one. I live in California, USA and often the parts stores have _nothing_ for Aston Martin [you folks in the U.K. have many more options]. A check of the Pepboys.com and Walmart.com website revealed some options for my 2005 DB9. After all, a Group 49 battery is the same for any car it fits in, and these are used in Bimmers, Jags, and our Astons. The least expensive compatible battery I could locally source was available from Walmart [stop laughing – some Aston owners are decidedly frugal]. 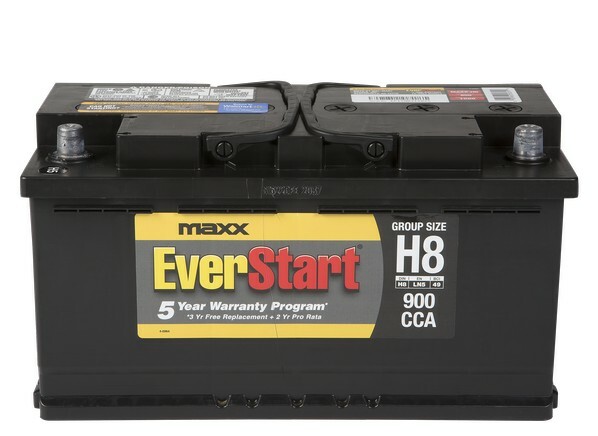 It is an EverStart Maxx-H8, available only through Walmart. This is a standard lead acid battery rated at 900 CCA and 140 minutes of RC. This battery is 13.90” Wide x 6.90” Deep x 7.5” High (353 x 175 x 190 mm). A weight was not published. It was reviewed by ConsumerReports.com and had a mediocre result (overall score of 56 out of 100 in the Group 49 Batteries). It costs $122 USD and I could pick it up locally. My favorite local parts store is Pepboys.com. 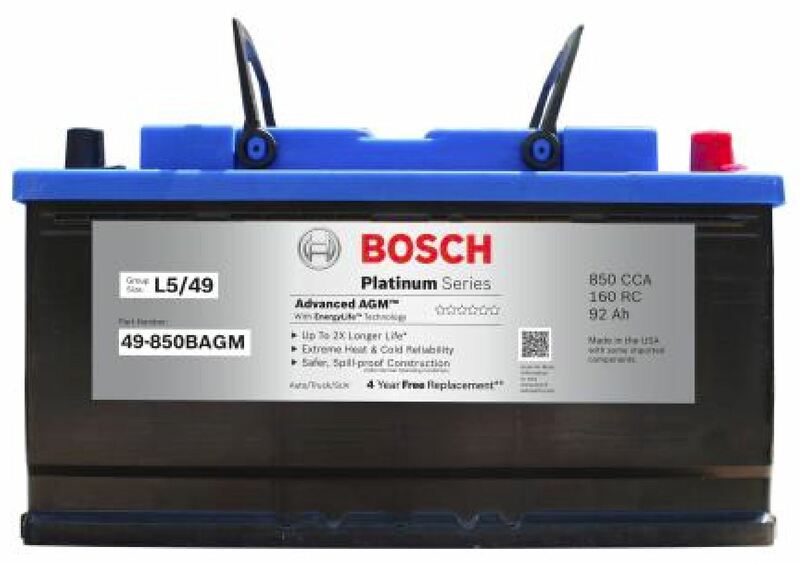 The best battery available was a Bosch Premium Battery model 49-850BAGM. This is an AGM battery rated at 850 CCA and a RC of 160 minutes. This battery is 13.93” Wide x 6.93” Deep x 7.5” High (354 x 176 x 190 mm) and weighs 52 lbs (23.6 kgs). It costs $187, and I can walk into a local store to get it. 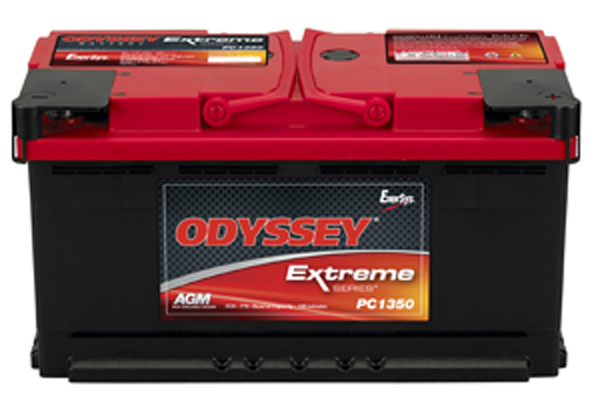 $372 USD for an Odyssey AGM battery that is likely the premium choice overall. I went for the middle choice and got the Bosch AGM. I also purchased myself an Odyssey Battery OBC-6A battery charger so I could charge it up if needed. This charger works for both Lead Acid and AGM batteries (automatically detects what it is connected to). I had just a manky old trickle charger in my garage, so this will serve me well for all my cars. The charger was $179 USD on the Odyssey website, but I found it on Amazon.com for just $118 USD with free shipping. In the next article I will show you how to actually replace the battery in your Aston Martin DB9. Check out who oddly my car behaved on low battery, and what it takes to boost it in this short video. It’s worth pointing out to you another article on batteries for the Aston Martin Vantage. I’ve discovered that someone has created a website for doing his own service on his V8 Vantage – Redpants.lol He appears to be more track, modification and performance oriented with his car and tips, and has a piece on replacing the battery in his Vantage with a smaller, lighter battery to reduce weight in his car (and thus make it faster). Check out the article here. The Battery is from Braille (model B3121) and saves 31 lbs (that’s a lot) and costs $229 is you buy it online yourself. To properly mount it you need his custom bracket, and he sells it or with the battery as a kit here. If you were interested, you could do the same mod to your DB9, the Vantage and DB9 shared the same battery. The CCA is only 550 amps and the RC is only 75 minutes as well. The weight savings comes at the expense of CCA and RC performance. I suspect it would not do well in cold climates [but who drives a DB9 in the winter anyways!]. Anyways, might be worth your time to check it out. Here are some high resolution photos of the Bosch battery from every side to satisfy the curious. Interesting Steve, since my battery was apparently replaced by my selling dealer just before I purchased my 2009 DB9 in November, I thought I’d check after reading your blog. There were some thing they claimed to have done that they did not (differential and engine oil change as an example) so I was curious. So here’s what I discovered, I have a new Interstate Battery model MT5-49/H8. CCA900. CA1000. RC 160. AH95 Group size DIN H*. EN LNH. BCI 49. with a full 30 month free replacement. They charged $280. Looks like all the right specs on the battery, just costs $100 more than Bosch. It looks like a nice AGM though and should serve very well. Did you have your DB9 connected to a trickle charger? Hi Chris. Nope, my DB9 is my daily driver. You might be wondering if the Aston Martin supplied trickle charger in the boot is AGM compatible, and that I don’t know for sure. I suspect it will ‘work’, but may not be the best for ‘cycling’ the AGM to keep it in top condition. I’d probably use the Odyssey charger and connect it to a cigarette lighter plug style so I could use it through the plug in the boot. Anyways, thanks for reading. Yeh who knows how much the dealer marked up the Interstate, only available through a dealer in this case. I’ve had good results using the trickle charger that came with my late 2015 C7 Corvette which I traded for my DB9 after the Corvette’s transmission failed at 7000 miles, lesson learned. I went the cheaper route (As I was expecting to get something better at some point) and fitted the Maxx H8. 2 years later its doing fine so for now I’ll leave it as is. 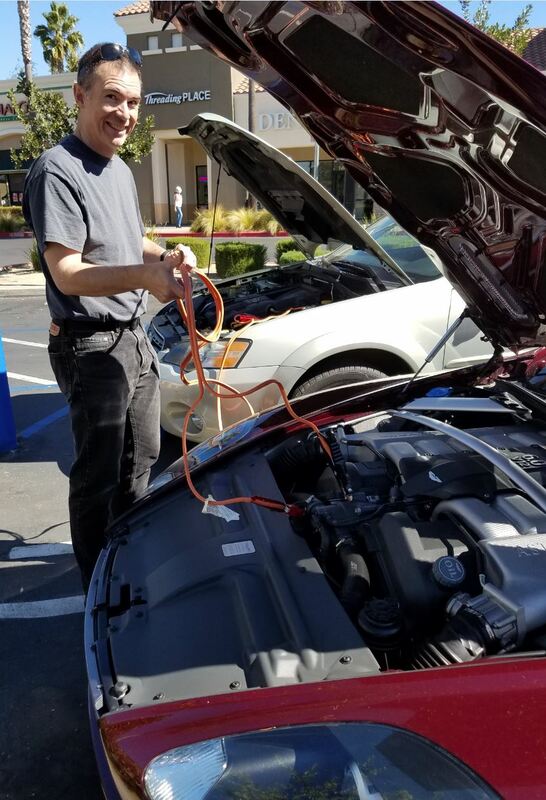 My car is used sparingly and is connected to the OEM AM trickle charger that connects through the funny 3 prong plug in the trunk when it’s not in use. I’d expect the Maxx H8 would work just fine for at least 5 years or more. The AGMs are supposed to go 10+. But my factory original batter lasted for 12 years, so who knows! Aston 1936 truly a great resource for DB9 owners. As we were leaving for a weekend trip in my “06 DB9 six speed, I noticed that the passenger seat would not move backwards, up or recline. Plenty of room for my wife for the trip. On my return I found your info on resetting seat and window modules which did the trick 🙂 I think the trouble may be that it’s time to replace the battery. I’m going to go with your advice on the Odyssey AGM. I have no problem buying their charger too but it would be nice to be able to use it through the lighter port in the boot. Any specific advice on how I might do this? Thanks! Wow, incredible weblog layout! How long have you been running a blog for? you make running a blog look easy. The whole look of your site is excellent, let alone the content! Thank you for putting this site together! I recently purchased a 2005 DB 9 and have found your articles and videos to be very helpful. I have a question about a after market battery charger. My car did not come with the AM battery conditioner, and I’m going to need to have one for the winter months. I live in Ohio. I have read about the CTEK MXS 5.0, but have not read if it is compatible with the three prong connector my DB has. Can I just plug it into the cigarette lighter in the console or the one in the trunk? Any insight you may have would be greatly appreciated. Hi Mark. I don’t have a solid opinion to offer. I don’t have the charger either, but I use my car as a daily driver year round so I haven’t needed one. I’ve heard the CTek is the way to go.In my trunk I have the 3 pin as well, plus the cigarette. Looking in the forums the CTek is the way to go, along with the Cig lighter adapter from CTek, then plug in the trunk. Let me know how it goes! Thank you Steve. I ordered the CTEK MXS 5.0 with the lighter adapter. It came yesterday and could not be easier to use. Hi, does anyone know if I can use original aston martin charger conditioner for 12V lead acid batteries (4g43-10c650-fb) if I have agm battery? What little I know is that the Aston Martin supplied charger is really a CTek model. If you already have the charger, if there is a clue on the body about which CTek model it is, we could refer to the CTek product page to find out if it is compatible with the AGM batteries. Several CTek models say they are. I’ve done some other reading on this, and some websites say yes, any charger will usually work. Others say no, they may have an incorrect voltage. Let me know if you figure out what CTek model your charger is.